This talk reviews the results of a research project conducted in Nuu, Kaupō, Maui. 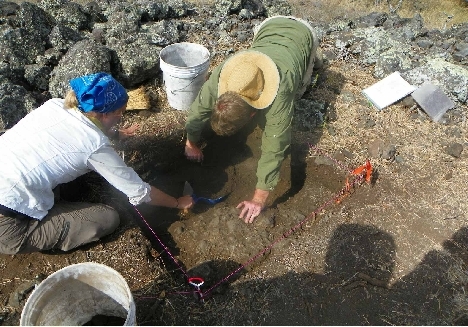 The focus of this project was an examination of the kauhale (house complex) construction phenomena researchers in Hawaiian archaeology postulate reflect a gender-segregated use of space and gender-segregated activities. Previous work in Hawaiian archaeology has relied on late 19th and early 20th century ethnohistoric documents that outline a hierarchy between binary male and female genders, reinforced by spatial separation of certain activities. The question remains to what degree these interpretations already reflect the adoption of a Eurocentric gender binary. Moreover, these sources clearly stem from a particular intersection of identity-- men of the dominant class in Hawaiian society. Drawing on excavations of seven house complexes in Nuu that date to the 16th to 17th centuries, the approach utilizes geoarchaeological methods to assesses the degree to which activities of everyday life were separated in space; the correspondence or lack of correspondence between activities that were evident in separate spaces; and the degree to which any spatial segregation of activities aligns with other evidence indicating the salience of class stratification. By using new methods which allow recovery of micro-residues, the difference in use of space within and between sites becomes increasingly visible. The results promise to provide a foundation for conceptualizing how daily practices in 17th century Hawaii shaped the landscape, with reverberating effects for the creation, maintenance, and subversion of hegemonic social structures.